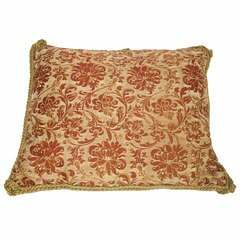 Vintage yellow and natural Fortuny stripes and flowers decorative handcrafted bolster pillow embellished with ATG custom flat golden silk trim, same silk as backing. Decorative bolster pillow handcrafted and designed in the USA. Throw bolster pillow with custom-made pillow insert and closure by stitch (no zipper.) Decorative bolster pillow handcrafted and designed in the USA. Throw bolster pillow with custom-made pillow insert and closure by stitch (no zipper.) Who was Mariano Fortuny? ….. While painting he also became interested in photography and theatre set design. Influenced by the Arts & Crafts Movement, he learned to control all aspects of his designs; for the theatre he created innovative lighting techniques, and he invented his own fabric dyes and fabrics, as well as machinery for printing cloth. He held more than 20 patents for his inventions. Abridged version from Britanica. Size: 15 x 20 x 6. 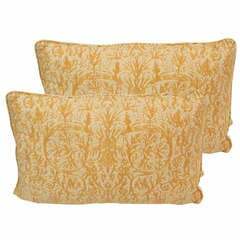 Beautiful lemon yellow Fortuny pillows backed in linen, filled with down. Sold individually, pair is available. 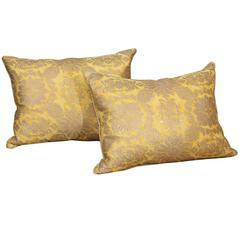 Vintage Fortuny Cuzco Pillow in black, tan, and silvery gold. 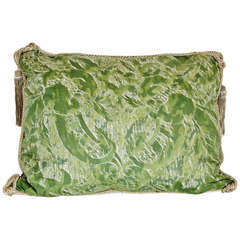 Pillow made from Vintage Fortuny Fabric. 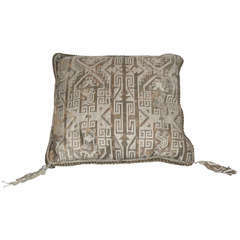 Pillow made from vintage Fortuny fabric, circa 1940. Vintage red and tan ticking bolster pillows. Sold as a pair only. Condition is very good. Raffia with geometric stitched design. Nigerian Kuba cloth. Zipper closure with feather and down fill.